The Sound A Doggy Makes: Things Which Would Prevent Me From Wanting To See A Movie: "127 Hours"
Things Which Would Prevent Me From Wanting To See A Movie: "127 Hours"
decent roles where I don't squint?…I've got it! I'll stop working with Judd Apatow! Dramatic roles! Of wounded people! Yeah!" 90 minutes of "How am I going to get out of this one? "/"Oh, well that didn't work. Heartbreakingly close, though." 90 minutes of watching some guy try everything short of cutting off his own arm, knowing all the while that he's going to have to cut off his own arm and then actually watching him cut off his own arm. 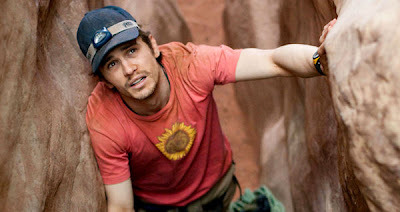 James Franco looking deliriously confused. Again.